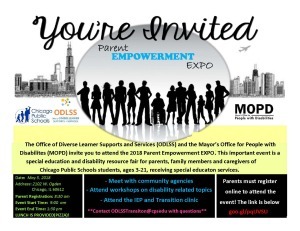 The Office of Diverse Learner Supports and Services (ODLSS) and the Mayor’s Office for People with Disabilities (MOPD) invite you to attend the 2018 Parent Empowerment EXPO͘. 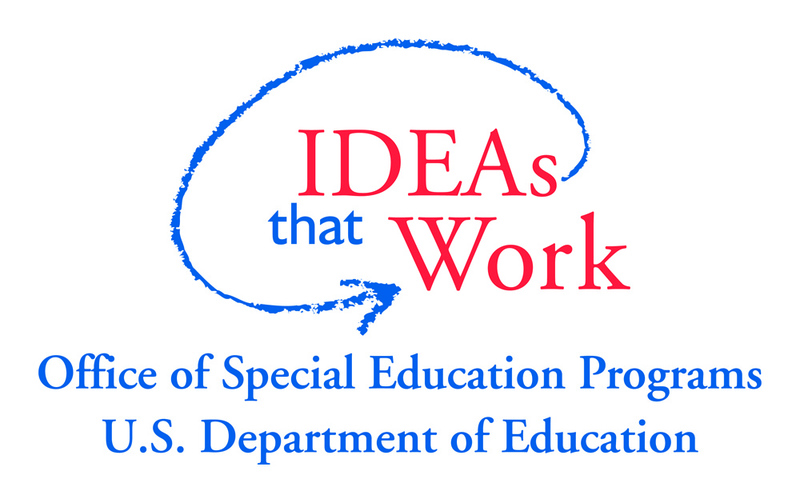 This important event is a special education and disability resource fair for parents, family members and caregivers of Chicago Public Schools students, ages 3-21, receiving special education services͘. Parents must register online to attend the event! The link is below goo.gl/pqUVSU . Date: May 5, 2018 Address: 2102 W. Ogden Parent Registration: 8:30 am Event Start Time: 9:00 am Event End Time: 1:30 pm LUNCH IS PROVIDED(PIZZA)! .To verify CPS Holidays, please visit CPS website at www.cps.edu and click on Calendar. CHILD FIND REGIONAL SCREENINGS ARE FOR CHILDREN WHO DO NOT ATTEND A CHICAGO PUBLIC SCHOOL. Acompáñenos y prepare sus preguntas, conozca a otros padres que también tienen dudas acerca de el proceso y los servicios que continúan en las Escuelas Públicas de Chicago CPS una vez que su hijo(a) cumple los 3 años de edad. Miércoles, 22 de Abril del 2015 de 12:30 a 02:30 p.m.
Costo: GRATUITO Los padres con hijo(a)s que actualmente reciben Intervención Temprana y sus proveedoras de servicios son bienvenido(a)s a participar. Se dará prioridad a las familias con niños de dos años de edad. Nos disculpamos por no poder recibir niños durante el entrenamiento, pero no contaremos con un espacio adecuado para ellos. Favor de confirmar su asistencia ya que el espacio es limitado. Envíe un correo electrónico confirmando su asistencia a mas tardar el 20 de Abril a consuelo.puente@frcd.org , escriba su nombre, y el nombre y la fecha de nacimiento de su hijo(a). También puede confirmar su asistencia llamando a Consuelo al 312-375-8136 a más tardar el 20 de Abril. Come; join other parents with your questions in an informal training centered on the process to continue services through Chicago Public Schools after your child turns 3. Thursday, April 23rd , 2015. Parents with a child currently participating in the Early Intervention program and their Early Intervention providers are welcome. Priority will be given to families with children who have passed their 2nd birthday. This training is for adults only. Sorry we are not able to safely accommodate children. Registration is required-space is limited to 30. Email your interest to roberta_hansen@rush.edu by leaving your name, and your child’s name and birth date by April 21st . We will send you a confirmation email. Any questions, call Roberta at 312-942-7863. 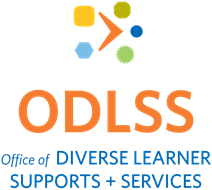 Chicago Public Schools’ Office of Diverse Learner Supports and Services (ODLSS) is inviting families of diverse learners to attend its annual education conference and fair. Come out and learn about ODLSS special education supports and services, get information about local and community resources and meet other families. This event is for CPS families of diverse learners ages preschool through high school. *We recommend, where possible, to make this an adult only event. The event format is conference style and the workshop sessions are not ideal for children. Child care is not available. For more information go to www.odlssparentexpo.eventbrite.com or www.cps.edu . February 12, 2015 5-7pm Register! May 14, 2015 5-7pm Register! February 19, 2015 5-7pm Register! May 21, 2015 5-7pm Register! February 26, 2015, 5-7pm Register! May 28, 2015, 5-7pm Register! Social Wellness and Social Success Groups now open for Registration! The Social Wellness Group is intended for children ages 9-12 with a High Functioning Autism Spectrum Disorder. 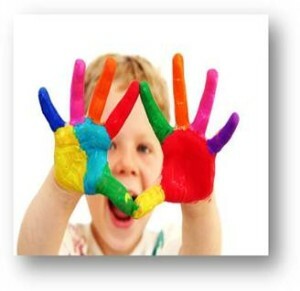 Children must be able to participate and gain from a 60-minute group session. The Social Success Group is intended for students middle school students in 6th-8th grades with a High Functioning Autism Spectrum Disorder. They must be able to participate and gain from a 60-minute group session and various community outings.